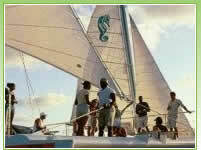 You will find yourself on a state-of-the-art custom built catamaran. This sailing cat will take you through that indescribable Caribbean blue water to one of Nassau's most beautiful reefs teeming with exotic wildlife. Everyone will have a chance to snorkel these lush reefs and, for you first-timers, the crew knows just how to instruct you so this experience will be forever memorable. 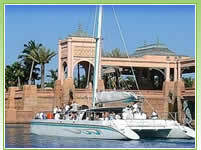 The catamarans themselves have spacious decks, cushioned seating, and private bathrooms. Room to spread out or an opportunity to make new friends - both are options on this trip. On your return, you can enjoy a rum punch, bottled water, or soft drink. Mon-Sun, Departure Times: 09:00am (3.5 hrs), 01:00 pm (3.5 hrs), Please check in 15 minutes before departure time. Wear your swimsuit and bring a towel, sunscreen, a hat, and your waterproof camera.